Huawei reported 1Q2019 revenue of CNY179.7 billion, an increase of 39% year-on-year. The company said its net profit margin in Q1 2019 was about 8%, slightly higher than the same period last year. As of the end of March, Huawei had forty 5G contracts and had shipped more than 70,000 5G base stations to markets around the world. Also in Q1 2019, Huawei's Enterprise Business Group launched its Digital Platform and its new "Huawei Inside" strategy. Huawei is committed to building the foundations of a digital China and the core of a digital world by delivering the Digital Platform along with ubiquitous connectivity and pervasive intelligence. Huawei's Enterprise Business Group also deployed the world's first 5G-enabled Wi-Fi 6 access point. As of the end of Q1 2019, Huawei had shipped more Wi-Fi 6 products than any other company worldwide. Huawei's Consumer Business Group continues to create value for consumers with its innovative products. Its core strategy is to deliver an intelligent experience to consumers across all scenarios. In Q1 2019, Huawei shipped 59 million smartphones. In other business segments like PCs, wearables, and smart home, Huawei has been welcomed by global consumers for its leading, innovative products and superior user experiences. HUAWEI CLOUD remains committed to innovation. It aims to build the best possible hybrid cloud, provide full-stack AI solutions for intelligent industries, and make inclusive AI a reality. More than one million enterprise users and developers have chosen to work with HUAWEI CLOUD. In Q1, HUAWEI CLOUD services were launched in Singapore, and HUAWEI CLOUD released its AI model market. HUAWEI CLOUD's one-stop-shop AI development platform – ModelArts – came first in both image classification training and inference in the Stanford DAWNBench deep learning competition. Huawei has focused on cloud-native as the cornerstone of its 5G core network solutions. Speaking at this week's Huawei Global Analyst Summit in Shenzhen, Jason Dai, President of Huawei Cloud Core Network Strategy & Business Development Dept, said Huawei is striving for a fully cloudified core network based on technologies such as three-layer decoupling, stateless design, cross-DC disaster recovery, containers, and service-based frameworks. Huawei's flow control algorithm enables 5G core networks to cope with traffic bursts caused by ultra-dense connections. 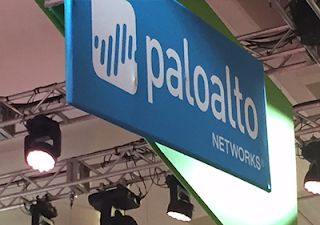 End-to-end network slicing enables new service models. Huawei 5G core network is based on the distributed architecture of control plane and user plane separation (CUPS), with its centrally managed control planes and one-stop plug-and-play ready user planes. 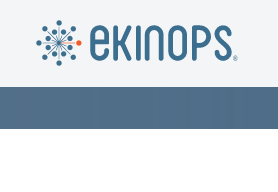 On-demand scheduling based on heterogeneous edge computing enables services to be processed only by the most suitable resources. DriveNets, a start-up based in Israel, announced 400G-port routing support to its Network Cloud software-based disaggregated router. The company says its Network Cloud is the only router on the market designed to scale 100/400G ports up to performance of 768 Tbps. 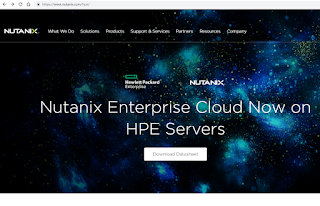 Inspired by the hyperscalers, Network Cloud runs the routing data plane on cost-efficient white-boxes and the control plane on standard servers, disconnecting network cost from capacity growth. DriveNets’ latest routing software release supports a packet-forwarding white-box based on Broadcom’s Jericho2 chipset which has high-speed, high-density port interfaces of 100G and 400G. 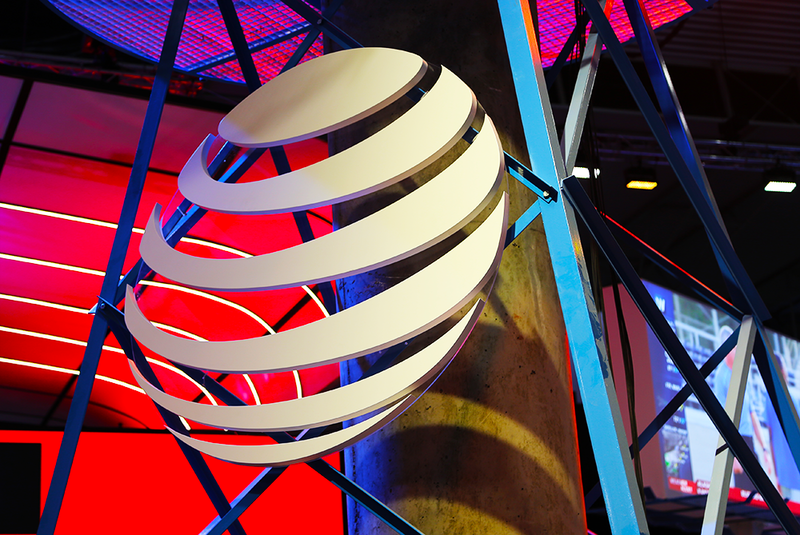 The platform is now being tested and certified by a tier-1 Telco customer. DriveNets was founded in 2015 by Ido Susan and Hillel Kobrinsky. Susan previously co-founded Intucell, which was acquired by Cisco for $475 million. Kobrinsky founded the web conferencing specialist, Interwise, which was acquired by AT&T for $121 million. In February, the company emerged from stealth with $110 Million in Series A funding. 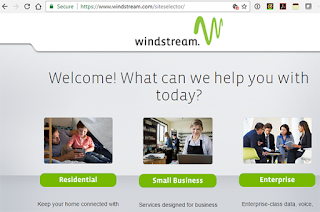 “Unlike existing offerings, Network Cloud has built a disaggregated router from scratch. We adapted the data-center switching model behind the world’s largest clouds to routing, at a carrier-grade level, to build the world’s largest Service Providers’ networks. We are proud to show how DriveNets can rapidly and reliably deploy technological innovations at that scale,” said Ido Susan CEO and Co-Founder of DriveNets. Zapata Computing, a start-up that spun out of Harvard University, raised $21 million in Series A financing for its pursuit of quantum computing. New and existing investors include Pitango Ventures, BASF Venture Capital, Robert Bosch Venture Capital, Pillar VC, and The Engine. Zapata is focused on the software and quantum algorithms to enable the next generation of discoveries — for a wide range of industries including chemistry, pharmaceuticals, logistics, finance and materials — on quantum computers. The software is designed to run on the latest quantum hardware made by Google, IBM, Rigetti, Honeywell, IonQ and others. CloudGenix is known for its AppFabric technology, which ensures application-specific, service-level agreements (SLAs). The company reports growth of 300% year-over-year, fueled by greater than 90% win-rates against incumbent legacy networking vendors. It customer wins include a large retailer based in Atlanta with more than 2,000 locations. The recent funding round included existing investors Bain Capital Ventures, Charles River Ventures, Mayfield Fund, and Intel Capital, and new investors including ClearSky. This brings total funding to $100 million. SENKO Components Jim Hasagawa and Tiger Ninomiya showcase SENKO's newest photonics integrated SN Connector designed by COBO standards. The SN Connector accelerates 400Gbps applications by eliminating the need for a breakout cable as the SN Connector runs 64 fiber lanes with the breakout at the adapter front panel. ADTRAN reported Q1 2019 revenues of $143.8 million compared to $120.8 million for the same period last year. Net income was $0.8 million compared to a net loss of $10.8 million for the first quarter of 2018. Non-GAAP net income was $4.9 million compared to a net loss of $15.8 million for the first quarter of 2018. 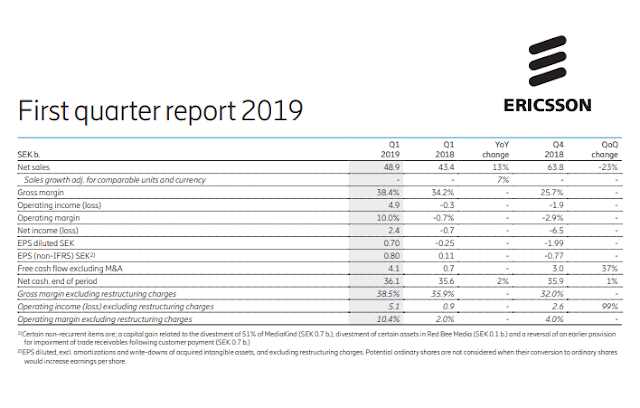 Driven by strong sales growth in North America, Ericsson reported Q1 revenue of SEK 48.9 billion, up 7% compared to the same period last year with constant currency. Gross margin was 38.4% (34.2%) driven by improvements in Networks and Managed Services. Operating income was SEK 4.9 (-0.3) b. and operating margin was 10.0% (-0.7%). Börje Ekholm, President and CEO of Ericsson, states: "5G services, including mobility, have been launched in South Korea and North America. While Switzerland has released spectrum allowing Swisscom to offer commercial 5G services, using our equipment, the development in other parts of Europe is considerably slower primarily due to lack of spectrum, poor investment climate and additional uncertainties related to future vendor market access. In Managed Services, sales fell organically by -5% due to headwind from contract exits. In the quarter, our Operations Engine was launched with good response from our customers. Gross margin improved to 17.7% (9.1%) YoY, supported by efficiency gains and customer contract reviews. Excluding a non-recurrent positive effect of SEK 0.7 b. from a customer settlement, the operating margin was 8.6%, exceeding the higher range of our financial target for 2020." Apple and Qualcomm agreed to settle all pending litigation worldwide and announced a multiyear chipset supply deal. Under the agreement, Apple will pay royalties to Qualcomm for six years, including a two-year option to extend. Apple will also make a one-time payment to Qualcomm. Financial terms were not specified. Shares of Qualcomm surged 23% on news of the settlement. Intel will exit the 5G smartphone modem business. 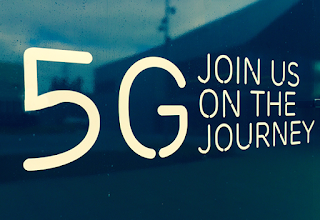 The company said it will continue to meet current customer commitments for its existing 4G smartphone modem product line, but does not expect to launch 5G modem products in the smartphone space, including those originally planned for launches in 2020. Intel has acquired Omnitek, a provider of optimized video and vision FPGA IP solutions based in Basingstoke, England. Financial terms were not disclosed. Omnitek was founded in 1998 and has developed over 220 FPGA IP cores and accompanying software including performance-leading solutions for WARP, ISP processing and video connectivity. Omnitek enables customized high-performance vision and artificial intelligence (AI) inferencing capabilities on FPGAs for customers across a range of end markets. “Omnitek’s technology is a great complement to our FPGA business. Their deep, system-level FPGA expertise and high-performance video and vision-related technology have made them a trusted partner for many of our most important customers. Together, we will deliver leading FPGA solutions for video, vision and AI inferencing applications on Intel FPGAs and speed time-to-market for our existing customers while winning new ones,” Dan McNamara, Intel senior vice president and general manager of the Programmable Solutions Group. Kanawa, a new subsea cable owned and operated by Orange in the Caribbean, is powered by Infinera’s fourth-generation Infinite Capacity Engine (ICE4)-based XTS 3600 platform and Infinera Instant Bandwidth. Kanawa, which spans 1,746-kilometers between French Guiana and Martinique, consists of two pairs of subsea fibers. It delivers 100 Gbps services and offers up to 10 Tbps of capacity. 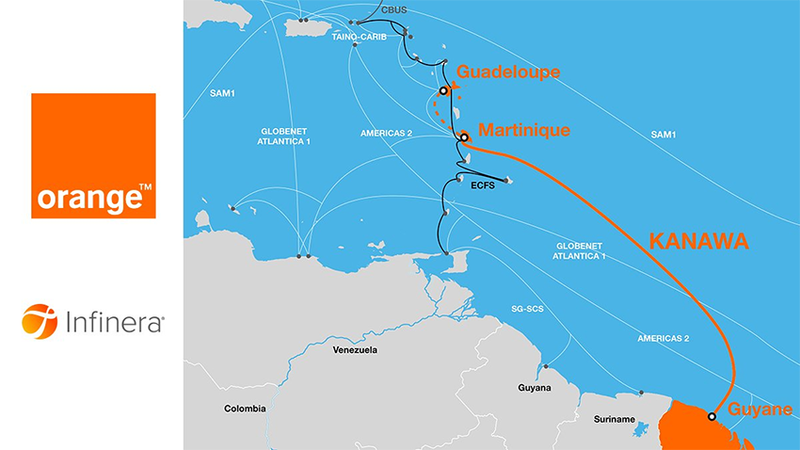 Orange deployed Infinera’s ICE4-based platform and Instant Bandwidth on the Martinique-Guadeloupe segment. With Infinera’s solutions, Orange can increase capacity as needed within minutes, without requiring any additional work on its subsea network, a distinct advantage it can pass along to its customers. 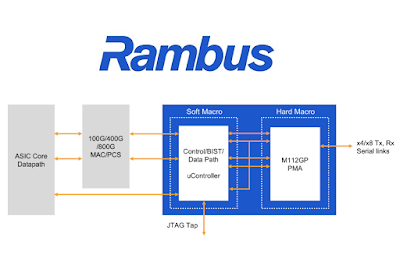 Rambus announced tapeout and availability of its new 112G Long Reach (LR) SerDes PHY on a 7nm process node. The 112G design is aimed at next-generation terabit switches, routers, optical transport networks (OTNs), and high-performance networking equipment. Rambus said its high-speed PHY provides the optimal combination of power efficiency, performance and area. Configurable to provide power, performance and area (PPA) optimization for medium reach (MR) and long reach (LR) applications. The Rambus 112G LR SerDes PHY is currently available for licensing. 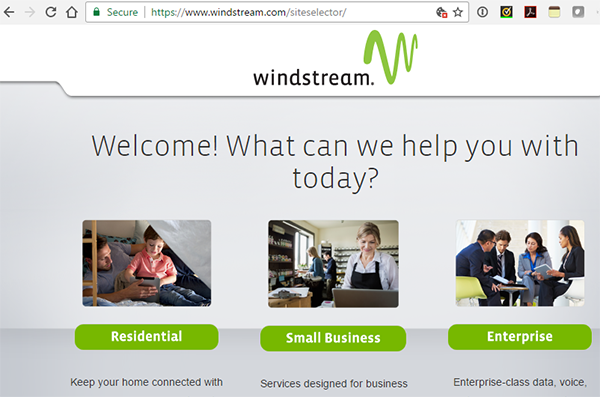 Windstream has selected Ciena’s 5170 Service Aggregation Platform to support its launch of 100 GbE services and improved network capabilities for 10 GbE aggregation. Mellanox Technologies reported record revenue of $305.2 million in the first quarter, an increase of 21.6 percent, compared to $251.0 million in the first quarter of 2018. GAAP gross margins of 64.6 percent in the first quarter, compared to 64.5 percent in the first quarter of 2018. “Across InfiniBand and Ethernet product lines, our innovations are driving continued market leadership. Our 200 gigabit HDR InfiniBand solutions are enabling the world’s fastest supercomputers and driving our overall InfiniBand growth. During Q1, HDR InfiniBand connected tens-of-thousands of compute and storage end-points across supercomputing, hyperscale, and cloud data centers around the globe to achieve breakthrough performance. Our Ethernet solutions continue to penetrate the market for both adapters and switches. Our market leadership in 25 gigabit per second Ethernet solutions is well established, and our 100 gigabit per second solutions are the fastest growing portion of our Ethernet adapter product line. We are also encouraged by the adoption of our BlueField System-on-a-Chip and SmartNIC technology. With further innovations to come, Mellanox is well-positioned to continue its growth trajectory,” Mr. Waldman concluded. Non-GAAP gross margins of 68.0 percent in the first quarter, compared to 69.0 percent in the first quarter of 2018. GAAP operating income of $44.7 million in the first quarter, compared to $12.0 million in the first quarter of 2018. Non-GAAP operating income of $86.3 million in the first quarter, or 28.3 percent of revenue, compared to $52.1 million, or 20.8 percent of revenue in the first quarter of 2018. GAAP net income of $48.6 million in the first quarter, compared to $37.8 million in the first quarter of 2018. Non-GAAP net income of $86.5 million in the first quarter, compared to $51.4 million in the first quarter of 2018. GAAP net income per diluted share of $0.87 in the first quarter, compared to $0.71 in the first quarter of 2018. Non-GAAP net income per diluted share of $1.59 in the first quarter, compared to $0.98 in the first quarter of 2018. NVIDIA agreed to acquire Mellanox in a deal valued at approximately $6.9 billion. The merger targets data centers in general and the high-performance computing (HPC) market in particular. Together, NVIDIA’s computing platform and Mellanox’s interconnects power over 250 of the world’s TOP500 supercomputers and have as customers every major cloud service provider and computer maker. Mellanox pioneered the InfiniBand interconnect technology, which along with its high-speed Ethernet products is now used in over half of the world’s fastest supercomputers and in many leading hyperscale datacenters. NVIDIA said the acquired assets enables it to data center-scale workloads across the entire computing, networking and storage stack to achieve higher performance, greater utilization and lower operating cost for customers. NVIDIA also promised to continue investing in Israel, where Mellanox is based. The companies expect to close the deal by the end of 2019. Southern Cross Cable Limited awarded a contract to Alcatel Submarine Networks (ASN) to supply the Southern Cross NEXT submarine cable, based on an Open Cable architecture. The Southern Cross NEXT submarine cable is a state-of-the-art 4 fibre pair undersea route utilising an open cable design and enhancing the existing Southern Cross eco-system. The system will also provide full fibre connectivity to Auckland, New Zealand, and will incorporate Branching Units (BU) and OADM technology for connections to Fiji, Tokelau and Kiribati. 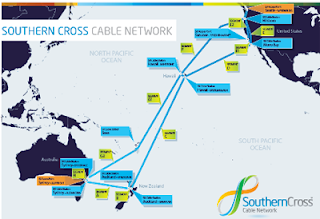 The US$350 million Southern Cross NEXT project will be the largest capacity, lowest latency link between the U.S. West coast and Sydney and Auckland, providing Australia and New Zealand, the largest capacity markets in the South Pacific region, with a powerful solution. The solution includes ASN’s submarine WSS ROADM units, the latest generation of repeaters and will offer high performance and powering resilience, enabling over 72 Tbps transmission capacity. The Open Cable system is also designed to be compatible with future generations of submarine line terminal equipped with Probabilistic Shaping technology. Telstra will acquire a 25 percent stake in Southern Cross Cable Network (SCCN) and substantial capacity on both its existing network and the new Southern Cross NEXT subsea cable. Existing stakeholders in SCCN include Spark NZ (50%), Singtel-Optus (40%) and Verizon Business (10%). SCCN owns and operates the trans-Pacific Southern Cross Cable and has initiated work on the Southern Cross NEXT cable, which will be a high capacity express route, providing data-centre connectivity between Sydney, Auckland, and Los Angeles and is scheduled for completion by end-2020. Southern Cross NEXT is expected to cost around US$300 million and is designed to carry 72 Terabits of traffic. China Mobile, Huawei, and Baidu showcased a 5G stand-alone technology delivering 8K video conferencing. At an event in Beijing, 8K live videos were collected, processed, and broadcast through the 5G SA architecture. These videos were also recorded with 8K cameras in real time and sent back to the 5G SA core network through 5G gNodeBs established by China Mobile in Beijing. After being quickly encoded and decoded by Baidu servers on the same network segment, the videos were sent back to the conference hotel for the 8K live video broadcast. The 5G network uses the 5G Vertical LAN technology to build a dedicated LAN where cameras, networks, and Baidu cloud servers are co-deployed. Huawei describes 5G Vertical LAN technology as one of the most promising technologies defined in 3GPP R16. RTI Connectivity Pte. Ltd. (RTI) reported that construction of the Japan-Guam-Australia South Cable System (JGA South) is on schedule and will be commercially available by the end of the year. JGA South has an initial design capacity of 36 terabits per second (Tbps), enabling carrier-neutral data centres in Sydney to connect to RTI’s combined cable landing station / neutral data centre in Piti, Guam. From Guam, JGA South connects seamlessly to key cities with neutral data centres including Los Angeles, California, USA, Tokyo, Japan, and Hong Kong, SAR, over the Southeast Asia-United States Cable System (SEA-US), JGA North and the Hong Kong Guam Cable System (HK-G), respectively. SpaceX's Falcon-Heavy rocket successfully launched Arabsat 6A satellite, a high-capacity telecommunications satellite that will deliver television, radio, Internet, and mobile communications to customers in the Middle East, Africa, and Europe. Arabsat 6A is the largest and most powerful commercial satellite Lockheed Martin has ever produced. Arabsat 6A provides advanced Ka-spot beam communications services and Ku and Ka-band coverages in addition to other frequency bands. It will be located at Arabsat exclusive orbital position 30.5, supporting Arabsat competitiveness, as the first satellite operator in the region, in respect to its capabilities and satellite broadcasting services. Arabsat-6A is part of the two-satellite Arabsat-6G program for Arabsat and is the second of Lockheed Martin's modernized LM 2100 series satellites to complete assembly. The other satellite in the Arabsat 6G program, Hellas Sat 4/SaudiGeoSat-1, recently completed assembly and was also shipped to Sunnyvale in November of 2017 for testing. "Arabsat-6A and its companion satellite, Hellas Sat 4/SaudiGeoSat-1 are the most advanced commercial communications satellites we've ever built," said Lisa Callahan, vice president and general manager of Commercial Civil Space for Lockheed Martin. "The modernized LM 2100 that these satellites are built on is packed with new innovations, including solar arrays that are 30 percent lighter and 50 percent more powerful, upgraded flight software and more efficient propulsion capabilities resulting in longer maneuver life. Those improvements will deliver greater precision, performance and value in orbit." CyrusOne sold approximately 5.7 million American depository shares of GDS Holdings Limited for a total purchase price of approximately $200 million. CyrusOne will continue to hold approximately 2.3 million ADSs, valued at approximately $90 million based on the GDS closing price on April 11, with the remaining shares being subject to a six-month lock up. NTT Communications inaugurated its “Amsterdam 1 Data Center” (AMS1), its first in the Netherlands. 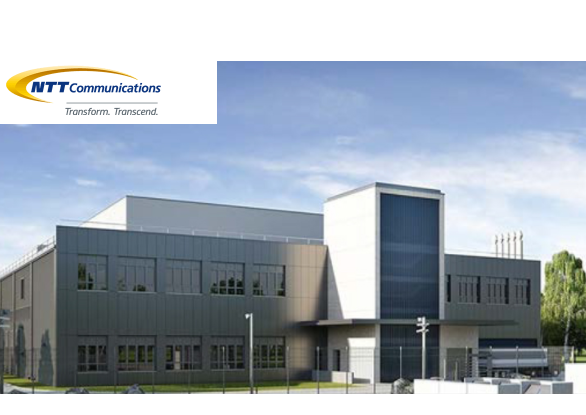 The facility is managed trough e-shelter, a subsidiary of NTT Com and one of the leading data center providers in Europe.